The TRP-C68H is an 8-ch analog Input differential isolation module that can read the voltage or current value from the web-based. The user can read the Analog input value from the web-based that includes the smartphone. Each channel allows the user to input the DC voltage or current. The watchdog function ensures TRP-C68H can running very stable without the firmware crash. the We built-in safety surge protection prevents the spark and damage analog chipsets at each channel. There are 3 protocols auto-detect that include ASCII and Modbus TCP RTU / ASCII. The watchdog function ensures running stable in the harsh environment. It allows connecting 1~8 sets of host IP in the network security. Wide input range DC power supply. 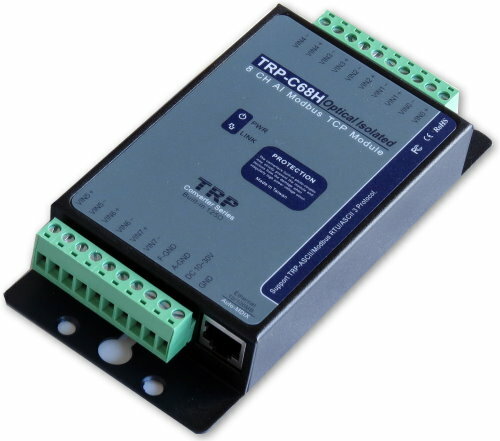 Automatically determine 3 TRP-ASCII and Modbus RTU/ASCII communication protocol. 16 TCP Port can be open at the same time. Heart Beat function ensures a reliable communicating connection. Maximum 8 sets host IP that limits network access. The web-based can be directly read analog value status. It is easy to update the firmware by LAN interface. Back to factory configuration by external touch button. Auto reconnection when power or Ethernet fail. Digital input signal from +/- 0 to 30V DC. Built-in surge absorbers in each relay N.C and N.O. Built-In watchdog function prevents system boot fail. LED for each I/O channels working status. 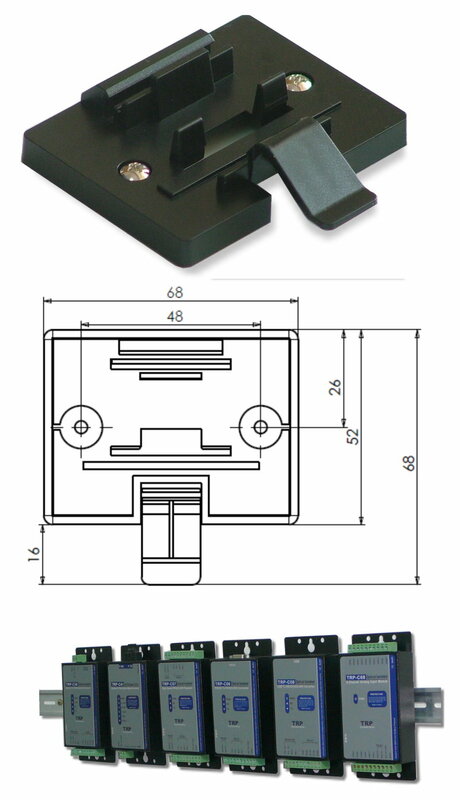 Support Auto-MDIX twisted pair crossover detection and Auto-Correction. DIN-Rail and panel mount support. Dual power input selects from screw terminal or DC-Jack. Sample rate: 24 BIT Normal mode: 10 sample / sec. 16 BIT Fast Mode: 60 sample / sec. Accuracy: Normal 0.1 or better. Analog input over voltage protection: +/- 48V. Power Input Voltage DC +10V to +30V. Protocol: TRP-ASCII and Modbus RTU/ASCII. Input optical isolation: 3750 Vrms. Configuration mode: Device Manager, WEB settings. Heart Beat: TCP Port sent string every 5 seconds. Connection type: Screw terminal for maximum AWG 12 wire. Power supply: Screw terminal, or external DC adapter. Operating environment: 0 to 50℃. Storage temperature: -10 to 70℃. Dimension: 151mm X 75mm X 26mm. © 2017 TRYCOM Technology Co.,Ltd.